Researchers announced today the discovery of the most massive, distant black hole collision ever observed, alongside the discovery of three other black hole collisions. When this happens, the black holes transfer energy to gas and stars between them, ejecting matter at high speed via a gravitational slingshot, thus losing energy. However, the volume of space subject to this effect shrinks as the orbits do, and when the black holes reach a separation of about one parsec, there is so little matter left between them that it would take billions of years to orbit closely enough to merge. This particular collision was spotted on July 29th, and located five billion light-years away from Earth. 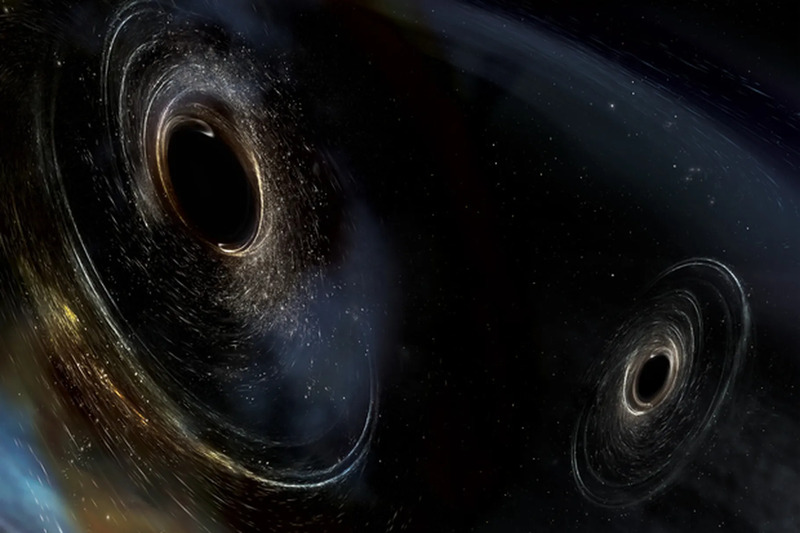 This event created a black hole about 80 times as massive as our Sun. Read more for another video and additional information. Immediately following a black hole merger, the now single black hole will “ring” – oscillating in shape between a distorted, elongated spheroid and a flattened spheroid. It’s damped in the next stage, called the ringdown, by the emission of gravitational waves. These distortions from the spherical shape rapidly reduce until the final stable sphere is present, with a possible slight distortion due to its remaining spin. “Gravitational waves travel at the speed of light, so this giant crash took place 5 billion years ago, about hundreds of millions of years before our Solar System even existed. The combination of the two was so powerful, that the equivalent of the mass of five Suns was turned into gravity waves — waves that reached Earth on July 29th,” reports The Verge.